Knowledge how to do things is a pervasive and central element of everyday life. Yet it raises many difficult questions that must be answered by philosophers and cognitive scientists aspiring to understand human cognition and agency. What is the connection between knowing how and knowing that? Is knowledge how simply a type of ability or disposition to act? Is there an irreducibly practical form of knowledge? What is the role of the intellect in intelligent action? the conflict. The essays also explore various ways in which this debate informs central areas of ethics, philosophy of action, epistemology, philosophy of language, and philosophy of mind and cognitive science. Knowing How covers a broad range of topics dealing with tacit and procedural knowledge, the psychology of skill, expertise, intelligence and intelligent action, the nature of ability, the syntax and semantics of embedded questions, the mind-body problem, phenomenal character, epistemic injustice, moral knowledge, the epistemology of logic, linguistic competence, the connection between knowledge and understanding, and the relation between theory and practice. 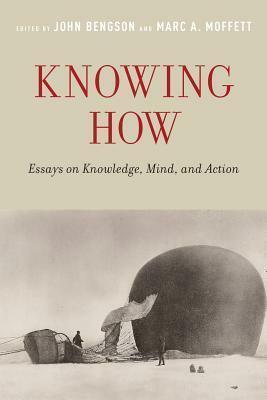 This is the book on knowing how-an invaluable resource for philosophers, linguists, psychologists, and others concerned with knowledge, mind, and action. John Bengson is currently a postdoctoral fellow in philosophy at the Australian National University and Assistant Professor of philosophy at the University of Wisconsin at Madison. His research is focused on issues in epistemology, philosophy of mind, and philosophy of action. Marc A. Moffett is Associate Professor of philosophy at the University of Wyoming. His research is focused on issues in epistemology, philosophy of language, philosophy of mind, and metaphysics.